When you start a new craft, you need to know what tools, equipment and supplies you need in order to really enjoy your new hobby. This post will outline for you all the hand sewing tools you will need for making your own hand stitched felt and fabric items. Get a very handy list of hand sewing equipment that you need. You can scan through the list quickly to check for what you have and what you still need to get. And there are also detailed explanations about what each item is and what you need it for. Hand sewing has fewer tools that you need and it is a very inexpensive craft to get into. One of the things I love best about hand stitching is that you can carry your projects around easily and work on them no matter where you are. First up is a very handy quick list of hand sewing equipment and supplies that you need to make plushies and felt items with. This equipment list gives you a very easy way to check what you have already and what you still need to get. After the quick list of hand sewing tools and supplies comes a detailed run-down of each item from the essentials right down to the desirable items. 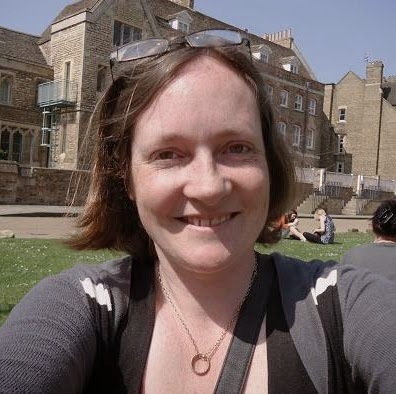 I'll explain what each item is needed for so you know whether it is something you actually need or not. Numbers 1-4 are the absolute essentials that you must have in order to sew with felt. You simply cannot start this craft without having the felt fabric, needles, threads and scissors. Number 5 is essential if you want to make stuffed toys, stuffed items such as pincushions and felt plushies. 6, 7 and 8 are not essential but I highly recommend getting these. Pins are so useful for temporarily attaching felt pieces to felt, fabric to felt and items such as trim and ribbon to felt. 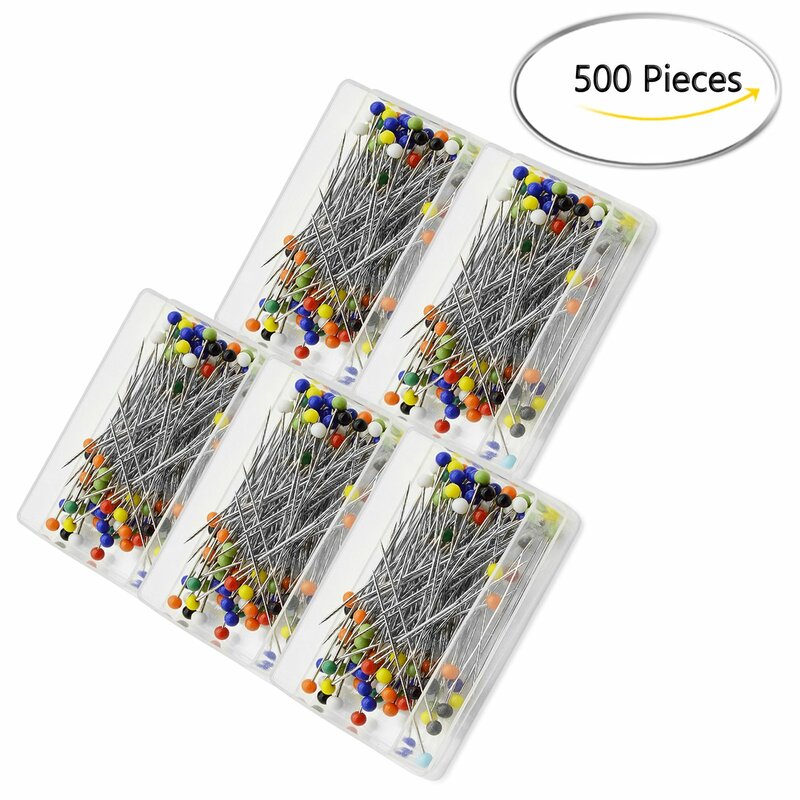 They make life easier and a pincushion gives you somewhere to store them too. Marking tools also come highly recommended because you can mark out temporary stitch lines for embroidery, mark out patterns for sewing and indicate where things are going on your felt. I would not be without mine. The rest of the items 9-15 are really optional. I would not be without most of them but you don't need to rush to buy them if you are new to felt sewing. Here's a detailed rundown of all the hand sewing tools and supplies along with how they are used. You can get felt cut to size off a roll or buy it in smaller pre-cut sizes. Normally you only need it to be cut from a roll if you are using large quantities of this fabric. An assorted selection of colored felt sheets is ideal for most beginners who want to make felt items and plushies. Felt sheets come in a range of sizes but 9 x 12 inches (or A4 size UK) is quite a handy size for storage purposes. If you are able to store larger sized sheets and also keep them nice and flat, go for it. ⭐ Having an assortment of felt colors to choose from is ideal because it will help to stop you from feeling restricted in what you can make. This is another reason to opt for a selection of colored felt sheets at the start. You can buy felt fabric from many places online including Etsy, Amazon and eBay as well as dedicated craft stores. The quality of some acrylic felt is usually okay for a beginner to work with (do read reviews though) and the cheapest option. It does help if you are able to see and handle the felt for yourself or even get samples of it before buying because they vary so much in quality and thickness too. A felt wool blend or mix is my favorite choice though this is more expensive. For starting out, I recommend that you practice on less expensive acrylic felt if cost is an issue. 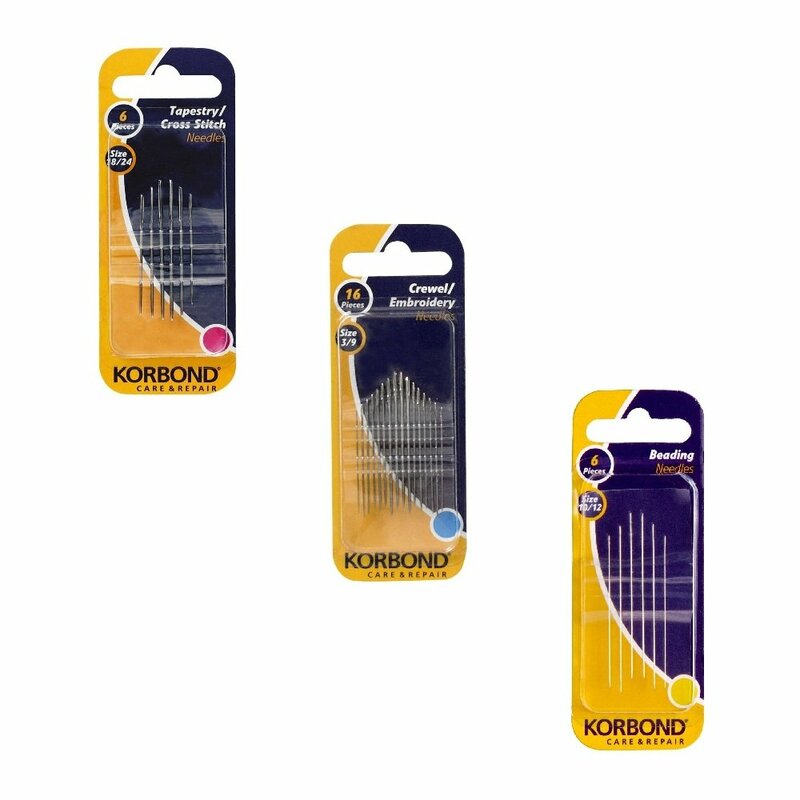 You need a selection of either sharps or embroidery needles for hand stitching with. Felt fabric needs a sharp tipped sewing needle to pierce easily through all the matted fibers. Embroidery needles and sharps both have a sharp tip which is necessary for your hand stitching. The only real difference is that embroidery needles may be a little longer and have a wider eye to accommodate thicker embroidery threads. Embroidery needles normally come in sizes 3-10 with 3 being the largest size. Needles are quite a personal choice and you may get through a number of different brands of needles before finding your favorite ones to stitch with. Medium sized needles tend to work best for felt because larger needle sizes can leave more visible holes in this fabric. Very fine and small needles can bend and even break if the felt is particularly tough. Getting a set of embroidery or sharps needles in assorted sizes is a great idea. Having a needle case to specifically store your favorite felt sewing needles in is handy. The plastic cases that needles are supplied in are often awkward to open and use. I prefer to make my own felt needle cases which are easy to make and an ideal beginner sewing project. I use two main types of thread for sewing felt with. The first type of thread that I use is polyester. And the second type is embroidery floss. There are many thread types that you can pick from but I recommend starting out with just a few that I know work well with felt. Both of these thread types have an essential place in my sewing tool box because there is no such thing as one thread suits all. Polyester thread is very tough which makes it last a long time and also makes it very hard to break. I've never managed to snap this thread while hand sewing. Good quality polyester threads are ideal for sewing where you know you need a strong stitch. 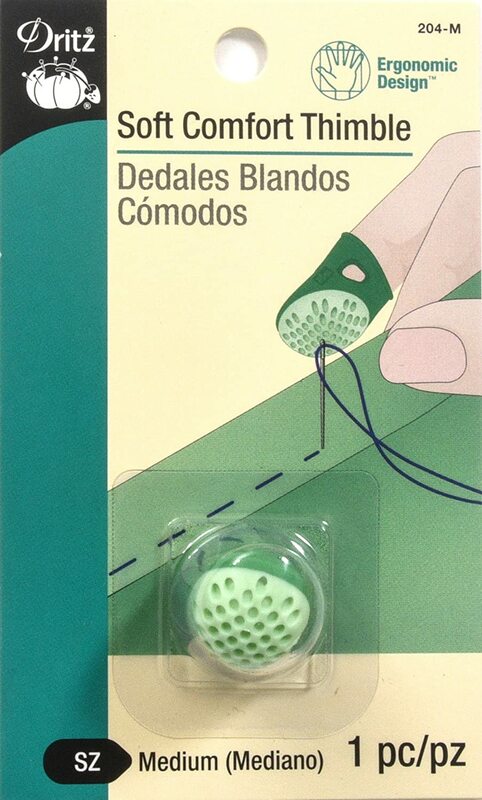 It is ideal for seams and for sewing items such as buttons in place where you need more of a robust hold. It can also be used for decorative sewing too. The polyester threads that I prefer to use are Gutermann. Since they also manufacture cotton threads, be careful to choose the polyester variety. As a natural material, cotton thread is wonderful but it really is not as tough as polyester. Cotton threads can break more easily and that is why I do not use it. 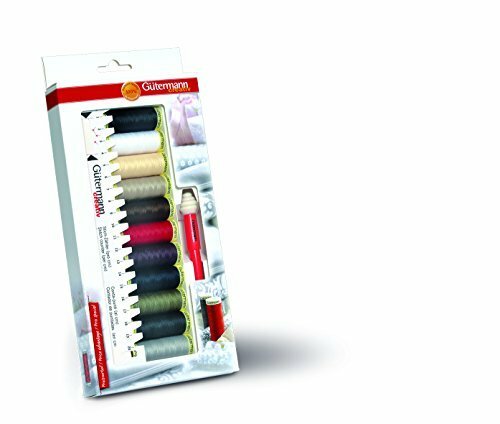 Gutermann polyester threads are available in a wide range of colors and spool sizes. In the case of hand stitching, their smallest range of spools (approx 110 yards) should really be more than sufficient to last you a long while. Although embroidery floss is much more prone to breaking and snapping than polyester threads are, I love how soft and beautiful it is to sew with. It is not an ideal choice of thread to use for seams and sewing on buttons because it is not nearly as tough. 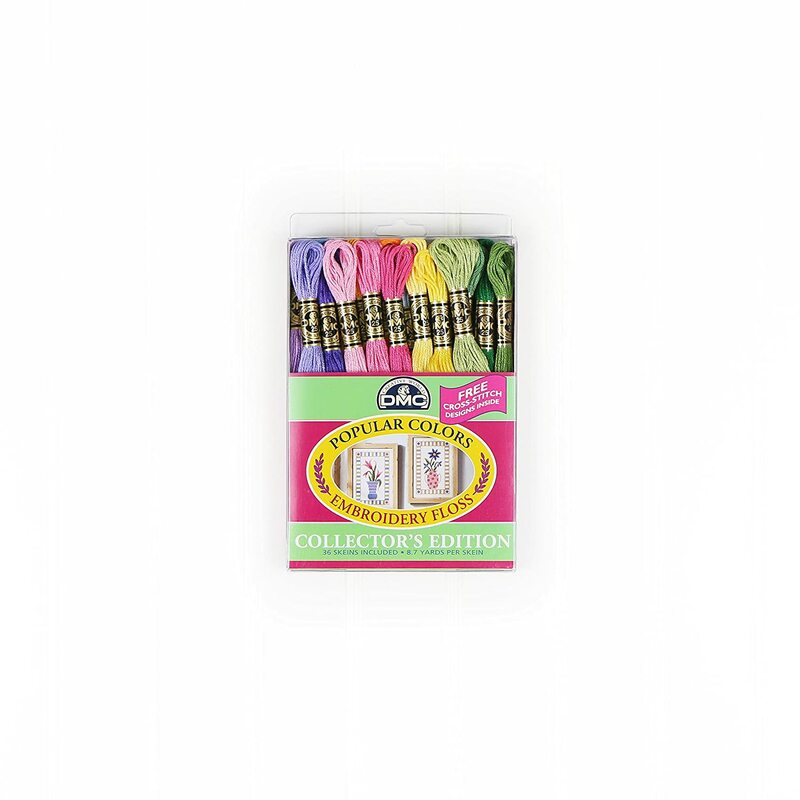 When adding more decorative features to your hand sewing, embroidery floss is a perfect choice. It can look stunning on your completed plushies and felt items due to the beautiful silky sheen and luster. Although polyester threads can be used for most decorative stitches, they don't work well for everything. Embroidery floss is really best for stitches such as the French Knot. ⭐ Embroidery floss comes in a lot of different types. You can get metallic threads and a much bigger range and choice of colors. Variegated embroidery floss is a type that I really love to use. I love variegated floss because they gradually change shade and even color while you stitch. Used carefully, they can make even the most ordinary project have the wow factor. As a beginner sewing felt items and plushies, it does make sense to make use of any threads that you already have and gradually add to those as you progress. This will help to keep your sewing hobby costs down to a minimum. Having a range of sharp and pointed fabric cutting scissors is really handy. I do have quite a range of different sized scissors from very small embroidery scissors up to large dressmaking shears. 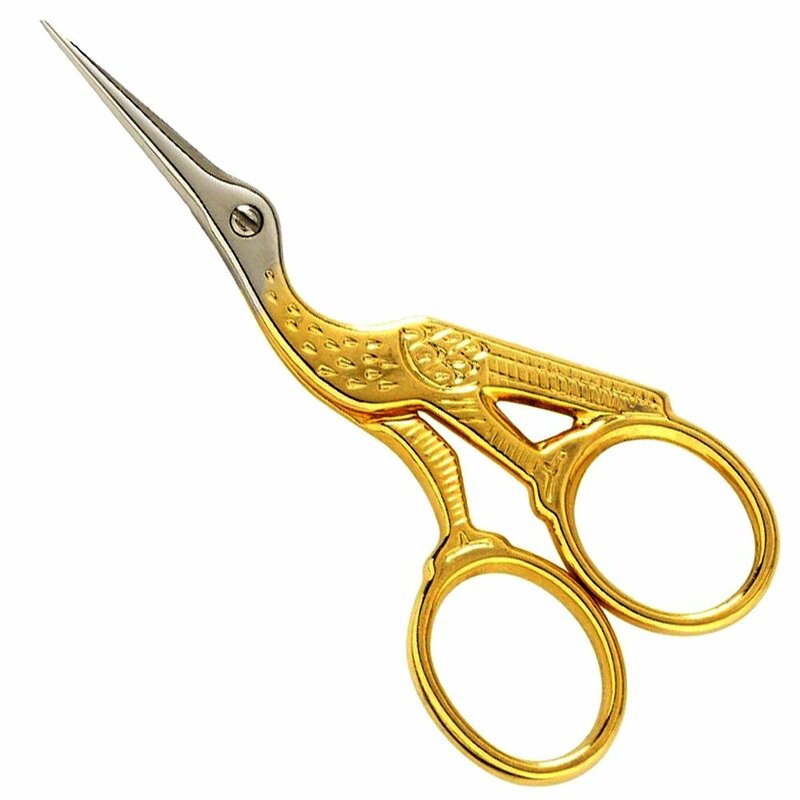 Small and sharp pointed embroidery scissors are very useful for small and detailed precision cutting with felt. Dressmaking shears are great for cutting out larger pieces of felt quickly and accurately. You'll likely need at least one more pair of scissors that falls size-wise somewhere in the middle of these two. Pinking shears are another useful addition to your sewing tools if you also wish to use patterned fabrics along with your felt projects. Pinking shears cut the fabrics with a slight zig-zag cut and they can help to prevent the fabric edges from fraying. Fiber fill is essential if you want to make plush stuffed felt items instead of just flat ones. For making items such as plush toys, stuffed pin brooches and pincushions, you will need a bag of polyester filling which is also known as fiber fill. This fiber fill is the same type that is normally used for stuffing toys with and it works very well. You will often need to temporarily attach and pin one piece of felt to another or pin fabric onto felt, especially if you are doing felt applique. 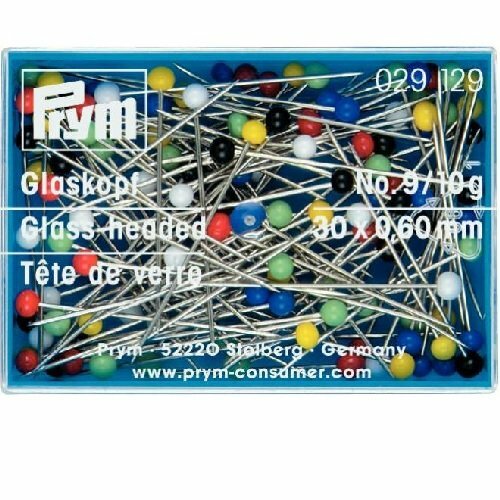 Glass head pins are my favorite because they have colored round glass heads at the top of each pin. The glass heads make them easy to see and easy to feel as well. It makes them easier to spot should you drop one and easier to feel in order to pull them out of your projects. I also love them because they are so easy to push into and pull out of a pincushion. A pincushion is a handy way to make grabbing your pins nice and easy when working on a felt sewing project. Other pins that you may need are long and fine dressmaker pins for pinning pattern templates to your felt. A pincushion is an essential piece of sewing kit in my humble opinion. I keep a pincushion right next to me at all times as I sew. Not only does it provide some handy storage for my glass head pins but also provides a very quick way to grab pins when I need them. Making mini felt plushies means that I often need to pin small pieces of felt or fabric onto larger pieces of felt. Sometimes I need to pin trim in place before sewing or just mark where I will be placing a decorative element such as a button. Pins are something I use often and having a felt pincushion to hold them snugly until I need them is a no brainer. My pincushions are normally weighted at the bottom or have a ribbon loop to hold them so they don't easily fall off the table - just something to think about. I haven't used them but there are also magnetic pin cushions which make it easy to drop pins into when you're done with them. You may need a way of marking your felt fabric. You may want to mark the felt when you draw around templates in order to make up specific patterns. You also may want to draw a temporary mark on the felt to provide a stitching line to follow when you are doing embroidery on top of it. 📘 Learn all about ways to temporarily mark your felt fabric HERE. My favorite way in which to mark felt is to use a water soluble fabric marking pen. These pens draw lines on the felt which can be dabbed off later with a little water to remove them when they are no longer needed. There are other variations on these types of temporary fabric markers. Another way to mark felt is to use tailor's chalk. This is a good option if you have a very dark felt which cannot be marked with a water soluble pen. You can choose a light colored chalk such as white or pink which will show up well on the felt. As well as tailor's chalk, there are modern variations of chalk pencils and pens. If you have trouble threading a needle due to having dexterity or sight issues, a needle threader could be a really great option to make this task easier. You can even get lighted needle threaders which supposedly make it easier to see what you are doing. I guess I'm lucky not to struggle with threading needles. I snip the end of the thread with a sharp pair of scissors so the end is cut neatly and this passes through the needle eye better than frayed or badly cut thread ends. People have different methods for threading needles. If this is something you struggle with, I advise searching for "threading a needle hack" on YouTube which gives you some good ideas. Some people swear by them but I don't particularly like to wear a thimble. The thimble though is very often misunderstood in hand sewing. It is not there to protect your hands from the sharp tip of the needle as is often thought. The idea of a thimble is actually to protect the middle finger (on the same hand that you use for stitching) from the eye end of the needle. The thimble helps to push the eye of the needle through the fabric as you sew with your thumb and forefinger. So the thimble really is a pushing tool because it is used to help push the needle through the fabric. Indeed, the small grooves you see on the traditional metal thimbles are there to catch the eye of the needle and stop it from moving as you push it through the fabric. You may or may not need a ruler and measuring tape. It is very rare that I use a measuring tape along with my felt sewing projects because I do not normally need to measure felt out. I would only measure felt if I had a larger pattern to work on and needed to see whether I had enough felt in a particular choice of color to make it. ⭐ If you're going to invest in a tape measure, buy a retractable one. Retractable tape measures are so much quicker to use. You pull the tape out to measure with and then press a button for the tape to swiftly reel itself back in. Nice and easy. A ruler is more useful to me with my felt projects. I often use a ruler when designing patterns and templates. Sometimes I'll use a ruler to mark out straight lines on the felt for embroidery as well. Because I like to make a lot of decorative items with felt, I keep a very generous stash of buttons and beads in all colors and sizes for enhancing any creative project. Buttons and beads often make great substitutes for items such as door knobs, windows and flowers. Buttons often make great eyes for animal plushies and can look very cute used in this way. They can also be used to add in a different texture to a project as well as hide and cover any unsightly bits of stitching. Ribbons and cords are very useful if you want to make a lot of hanging decorations and ornaments. It helps to find a length of cord or ribbon that will look good with your project. You can make pretty bows with ribbon to sew on as decorative elements. Cord can be sewn over to make raised sections of embroidery. And trim can be added for pretty detail. 📘 Learn about how to use these to turn small felt plushies into hanging ornaments HERE. These are additional extras that can really help to make your felt projects really unique and special. Having your felt creations stand out is even more important if you are selling them. You want people to look at your work and find it so enchanting that they simply must have it. Patterned fabrics such as printed cotton work wonderfully when used along with felt craft projects. Adding a small amount of patterned fabric onto a felt design breaks up the solid color felt and adds another layer of interest. Since ordinary fabrics fray around the edges, you need some way of dealing with that. You can invest in a good pair of pinking shears which cut the edges in a zig-zag pattern to help reduce fraying. You can use a fray check liquid or you can learn overcast and edge stitches such as blanket stitch which you sew over the edges in order to reduce fraying. The last hand sewing tool that you really need, and especially after collecting the previous suggestions, is a sewing box or bag. You need some way of keeping everything neatly together so it is all there in one place when you want it. I have a lovely traditional wooden sewing box which was given to me by my parents as a craft mad teenager. I love this box and can fit a lot in it. When traveling, I take all the sewing items I need with me in a zipped bag. I won't take everything (as that would be ridiculous) but instead pick out threads, felt and other items that I'm likely to need for the project I'm working on at the time.